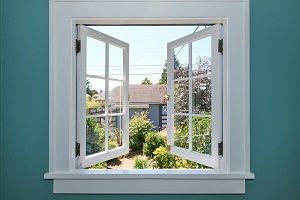 Opening your windows is an effective way of ventilating your home. You can open the windows for a few minutes even when it’s chilly outside, but you may want to skip this step if the pollen count is too high and you’re allergic. If possible, you should aim for cross-ventilation and open as many windows as possible. Just be sure to use doorstoppers to prevent the doors from slamming shut. Opening your windows is a perfect way to save on utility costs when it’s mild outside because you can ventilate your home without turning on your air conditioning. Taking your shoes off at the door reduces the amount of dirt and debris you bring into your home. Even when your soles are visibly clean, they are still contaminants attached to your shoe. If not wearing shoes in your home is impractical, you should at least invest in a doormat and ask everyone to wipe their shoes before coming in. It may take some time for everyone to get used to it, but wiping your shoes before entering will quickly become a habit for your family. Dust and dirt tend to linger on the floors. If you have tile or laminate, you can see that it’s necessary to sweep almost every day. The same may be true for your carpets, but pollutants can hide inside the fibers, which makes them look clean even when they aren’t. Vacuuming often will keep your indoor air cleaner because the pollutants aren’t lingering in your home. And if you have pets, frequent vacuuming is even more important because they track in additional dander and debris.